The black-eyed pea or black-eyed bean is a subspecies of the cowpea, grown around the world for its medium-sized, edible bean. It is pale-colored with a prominent black spot. 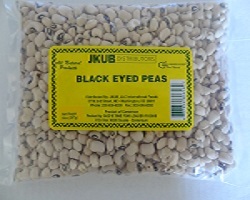 A common variation of the black-eyed pea is the purple hull pea; it is usually green with a prominent purple or pink spot. The currently accepted botanical name for the black-eyed pea is Vigna unguiculata subsp. unguiculata, although previously it was classified in the genus Phaseolus.